Bus rides across Colombia are undoubtedly long and tedious; crossing various mountain ranges just to get a few hundred kilometres can take 12 hours of travel. However, it was a necessary evil if I was going to be able cycle traverse a high altitude volcano on a prohibited mountain pass with Cass Gilbert (www.whileoutriding.com). The long distance bike-packing velo-journalist and talented photographer had only just over a week left in Colombia and we were on different mountain ranges; time was short. 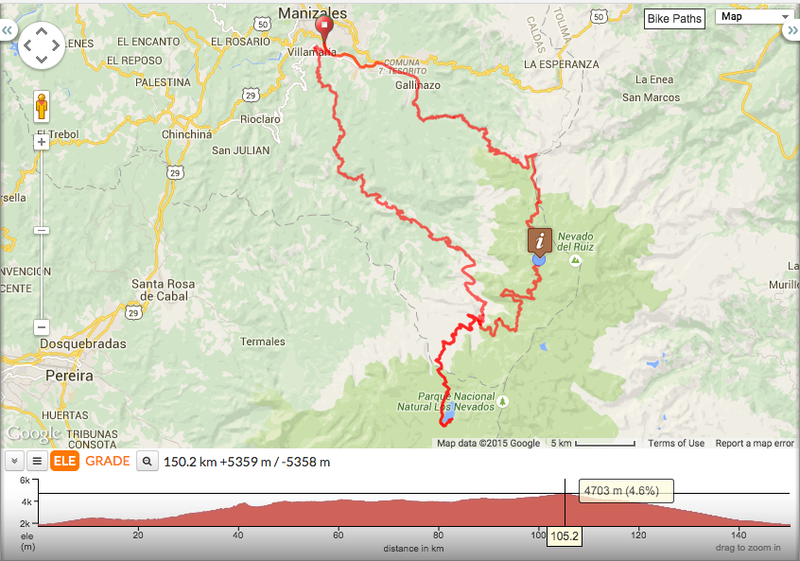 So we decided catch public transport to meet up in Manizales and ride Los Nevados. Our 4 day adventure to the park subsequently involved riding through a cold rainy night from 3 am so that we could climb up to 4700+ metres on a closed mountain pass. We were rewarded with views of snow covered (and yellow alert) Volcano Ruiz fuming away and fantastic volcanic landscapes as we headed up and over the high point for the long descent. Although I was suffering from a heavy cold, an upset stomach and the effects of altitude, it was an unforgettable ride and worth every minute spent on the two legged 12 hour+ bus ride to get there. After a couple of nights at Villa de Leyva, I left some of my kit with Duvan (warmshowers host) and headed off at 5am towards Manizales via Bogota to meet up with Cass. That evening we finalised the details of our journey into Los Nevados Parque Nacional from our cheaply priced hotel (often used by the bus drivers from the main Manizales bus station situated 3 minutes away by foot over the footbridge). 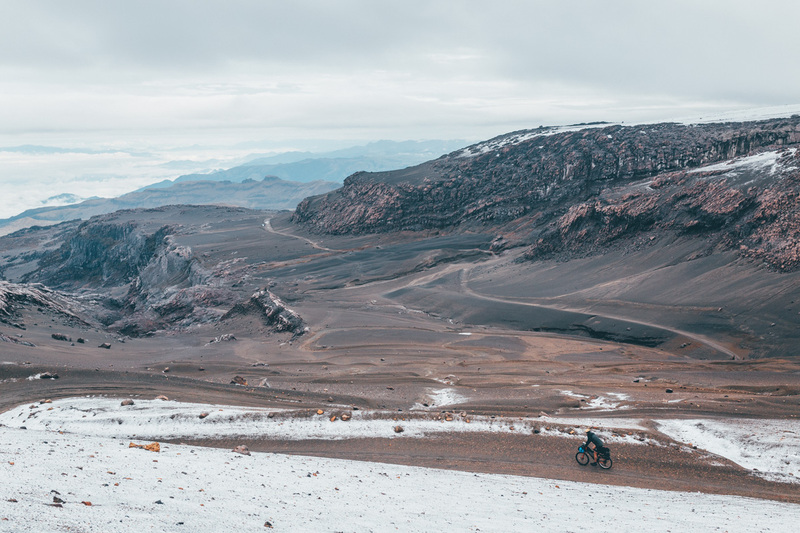 Cass’ superb photos (like the one he took below), his account of our experience and more details about cycling in Los Nevados can be found here Bikepacking Parque Los Nevados, Colombia. 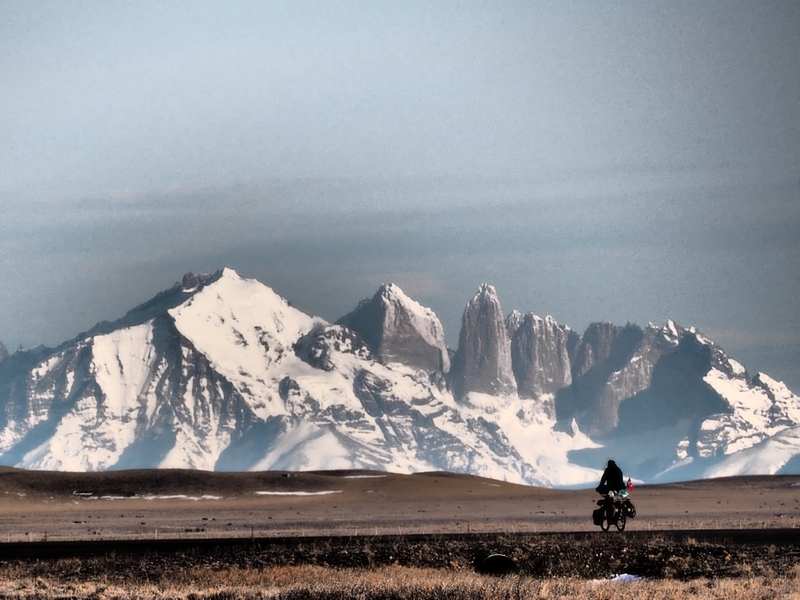 Paul has previously cycled this route on his own, his entertaining and well written account can be found here: PARQUE NACIONAL DE LOS NEVADOS: AN ADVENTURE TOO FAR? The route up to Ruiz was closed due to volcanic activity when we passed it. We climbed over the gate and rode the closed pass to Las Brisas (which is where the closed section ended), I wouldn’t necessarily recommend doing this since it was closed for a reason. In case one day it opens here is the route map. The high point is marked by the ‘i’. Interactive version with points of interest and gpx download / export click here. This map was made after the trip with ridewithgps.com. Altitude varied from 1840m up to over 4700m (total climbing 5300M+). Google maps isn’t 100% accurate with the tracks in this park so some estimations on the route have been made. More or less it seems like a reasonable estimation of the route. Brave move, Nick… but worth it!